This was given as a gift by a friend who shares the same enthusiasm of the dreams of this blog reaching the shores of France. 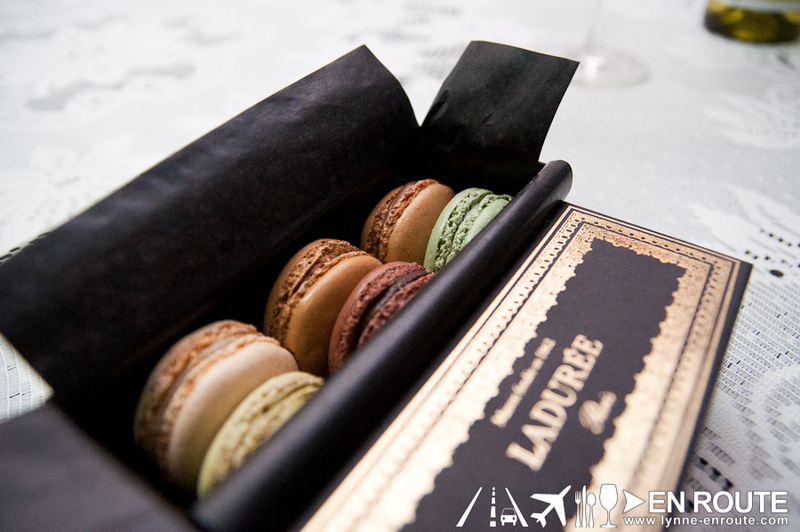 Laduree is actually a French brand of luxury pastries, but they are known also for making some of the best macarons in the world. There are outlets already in London, New York, Hong Kong, and other global melting pots. It will not be surprising if this reaches Philippine shores. Think about it: those expensive Patchi Chocolates of Lebanon made it here. 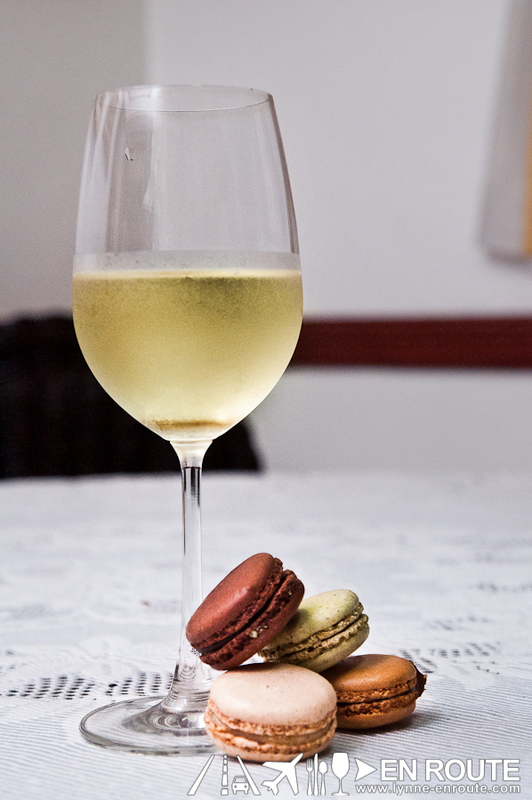 It does beg the question: What is in a macaron that it garners quite a frantic following anywhere in the world? To describe its relative physical appearance, it is about as wide as a POG cap in diameter (kids who lived in the late 80’s to early 90’s will remember this), as thick as two salt crackers stacked together, comes in colors that can rival a 64-piece Crayola set, and can cost more than a Crispy Chicken Sandwich or Crunchy Chicken Burger per piece. These macarons are very delicate. It has the texture of a soft meringue and easily melts in your mouth, and can be consumed in less than a second (probably faster than inhaling air). Given the price, though, you may want to cherish each and every nibble in this airy, almond based cookie that can be mistaken for a child’s play-dough creation. 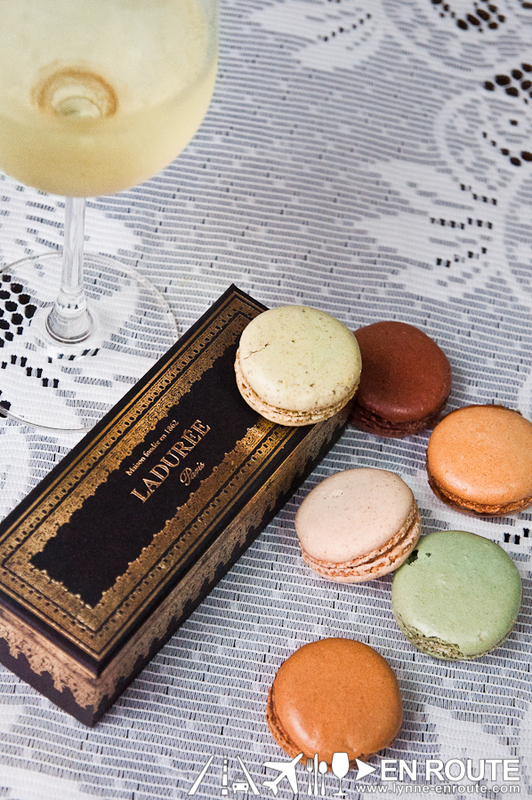 Laduree, in particular, has a macaron with caramel and salt flavor filling with the consistency of Nutella and tastes as good, if not way better. A little research shows that this goes great with tea or your preferred liqueur. In En Route, it is, preferrably, going to be the liquor based indulgence. For experiementation purposes, it was paired with wine, probably going against any lectures learned in any Wine Tasting Seminar. But it does work, at least with white wine. So it does go to show that your food and drink pairing ultimately depends the taste of the person. Or it can be the lack of such taste of the people who write here in En Route.